Today when this extensive and great world is in the shadow of diverse means of communication, just like an enclosed and confined house it is joined and grafted together and confined house it is joined and grafted together, the manner of personal and group communication forms one of today's most important problems. We observe abundantly and clearly with our own two eyes that this communication and contact, instead of bringing about prosperity, comfort and serenity it unfortunately moves in the direction of personal and group profit or loss, and regards, desiring unjust superiority as the foundation, that is why conflicts of mind and body and heavy intolerable war starts all over this world. 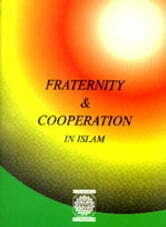 What is the remedy of this principal problem and world trouble in sublime and original Islamic doctrine? What does the verses of the Holy Quran, traditions of the Holy Prophet (s.a.w) and the infallibles, peace be upon them, teach us on Islamic brotherly rights? How does it teach us cooperation and dominance over selfishness and egotism? Reading over this small book which contains, in a summary the text translation and explanations of the holy documents of the holy doctrine on this subject, prompts friendship and serenity on our spirit, so with out own two hands, and with the help of the twentieth century's great facilities, to the extent of our ability we smooth the path of prosperity and in the period of world confusion we can create a heaven of serenity and fraternity around us.